14 of the 20 Premier League teams including last season’s Champions, Leicester City, plus top teams from the European leagues! 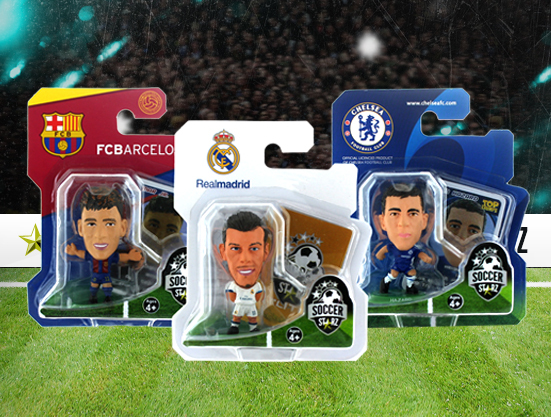 Fantastic re-sculpts of Messi, Bale, Lukaku and Ozil! This Summers big transfers such as Mkhitaryan, Ibrahimovic, Gundogan and Batshuayi! 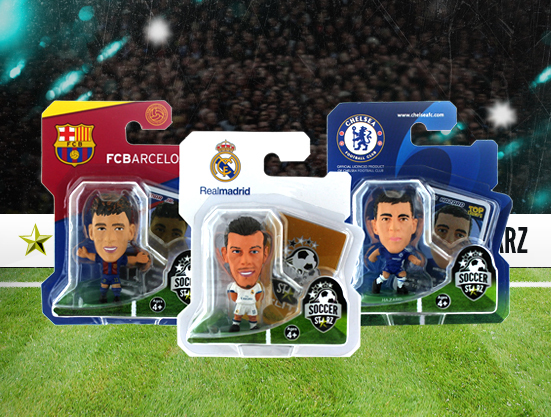 Stars from last season such as Kane, Vardy, Mahrez, Aguero, Ronaldo and Sanchez! 30 of the top players from Leicester City, Spurs, Man City, Barcelona, Arsenal, Chelsea and Liverpool even include a mini Top Trumps card! SOC020 Jack Wilshere Shop Now! SOC074 Alex Oxlade-Chamberlain Shop Now! SOC851 Danny Welbeck Shop Now! SOC1107 Nico Gaitan Shop Now! SOC1129 Jasper Cillessen Shop Now! SOC677 Pierre-Emerick Aubameyang Shop Now! SOC679 Sven Bender Shop Now! SOC682 Marco Reus Shop Now! SOC840 Shinji Kagawa Shop Now! SOC879 Erik Durm Shop Now! SOC881 Lukasz Piszczek Shop Now! SOC1030 Matthias Ginter Shop Now! SOC1101 Marc Bartra Shop Now! SOC1103 Julian Weigl Shop Now! SOC1118 Mario Gotze Shop Now! SOC1119 Andre Schurrle Shop Now! SOC140 Anthony Stokes Shop Now! SOC142 Emilio Izaguirre Shop Now! SOC145 James Forrest Shop Now! SOC148 Scott Brown Shop Now! SOC691 Kris Commons Shop Now! SOC698 Leigh Griffiths Shop Now! SOC885 Craig Gordon Shop Now! SOC1060 Stuart Armstrong Shop Now! SOC011 John Terry Shop Now! SOC047 Branislav Ivanovic Shop Now! SOC719 Diego Costa Shop Now! SOC1108 Michy Batshuayi Shop Now! SOC888 Alan Pardew Shop Now! SOC1110 Steve Mandanda Shop Now! SOC929 Tom Cleverley Shop Now! SOC934 Gerard Deulofeu Shop Now! SOC1083 Romelu Lukaku Shop Now! SOC1055 Danny Drinkwater Shop Now! SOC1082 Wes Morgan Shop Now! SOC1087 Claudio Ranieri Shop Now! SOC357 Philippe Coutinho Shop Now! SOC418 Mamadou Sakho Shop Now! SOC228 Yaya Toure Shop Now! SOC735 Bacary Sagna Shop Now! SOC971 Fabian Delph Shop Now! SOC982 Nicolas Otamendi Shop Now! SOC1130 Claudio Bravo Shop Now! SOC031 Wayne Rooney Shop Now! SOC889 Marcos Rojo Shop Now! SOC900 Memphis Depay Shop Now! SOC941 Bastian Schweinsteiger Shop Now! SOC960 Morgan Schneiderlin Shop Now! SOC501 Thiago Motta Shop Now! SOC1113 Hatem Ben Arfa Shop Now! SOC1123 Jese Rodriguez Shop Now! SOC812 James Rodriguez Shop Now! SOC314 Glenn Whelan Shop Now! SOC317 Jonathan Walters Shop Now! SOC807 Bojan Krkic Shop Now! SOC827 Marko Arnautovic Shop Now! SOC321 Lee Cattermole Shop Now! SOC897 Jermain Defoe Shop Now! SOC1120 David Moyes Shop Now! SOC330 Wayne Routledge Shop Now! SOC395 Neil Taylor Shop Now! SOC398 Sung Yeung Ki Shop Now! SOC816 Gylfi Sigurdsson Shop Now! SOC891 Jefferson Montero Shop Now! SOC087 Kyle Walker Shop Now! SOC892 Harry Kane Shop Now! SOC337 Jonas Olsson Shop Now! SOC716 Craig Gardner Shop Now! SOC898 Darren Fletcher Shop Now! SOC933 Dimitri Payet Shop Now!